Drawings - form a set made by the same hand and with the same borders and it is interesting to see, for example, the occupants of Soane's added wings. These drawing would have been made by a pupil as part of his education and at the same time as a record for Soane's own use. 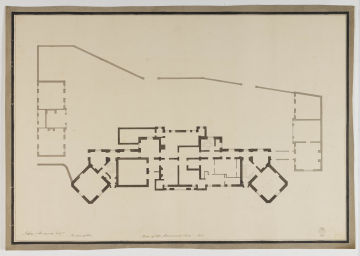 Often such drawings would be pasted into a folio volume and might be shown to colleagues and patrons as well as enjoyed by Soane himself.